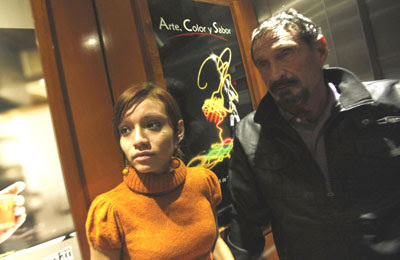 John McAfee and his girlfriend, Sam, made it to Guatemala. What's next?! Frustration. I'm spending inordinate amounts of time sitting in front of my computer, trying to find the motivation and focus to start putting serious time into my dissertation. This has been going on for weeks. What else has been going on for weeks? Regular readers know that I've been in Belize for the better part of the last year and half working on my dissertation research. Belize also happens to be the adopted (former) home of John McAfee, the founder of the ubiquitous virus protection software company. McAfee has been on the run from the Belizean police for the last three weeks, wanted for questioning in the murder of his neighbor. Right there is at least a semi-interesting story, and I'm drawn into it because of the Belizean-connection. But that's like the needle on top of the iceberg in this story. I've already written a piece on McAfee that will be published here on RM in the near future, but right now it's sitting in the inbox of the editor at Anthropology News, where it will go up first. It's been there for a few days now, and it's killing me, as this story is only getting more and more popular. My connection to McAfee is a little deeper than just Belize. In 2009 I met the ethnobotanist he hired to start his now infamous plant remedy lab that was later raided by the Belizean Gang Suppression Unit. They thought he was manufacturing meth, but all they found was weapons. After the lab raid, Belizean authorities continued harassing McAfee, and eventually got their golden opportunity to get him when his neighbor turned up dead with a gunshot to the head. McAfee feared the setup and went into hiding. He evaded the authorities for weeks, all the while blogging about his adventures - and the deep seeded corruption in Belize. He gave interviews to outlets all over the world and eventually had Vice Magazine join him to film the escapades. Vice screwed up and published a picture with geodata still attached, which pinpointed where the picture was taken. Oops. They had made it into Guatemala, but had done so without the proper immigration visit. McAfee got a lawyer and asked for political asylum. He got arrested anyway, but managed to keep blogging, even while in jail. The latest, he was taken to the hospital after having some kind of convulsion. Reports are that he had two minor heart attacks, or maybe just flipped out when he heard his asylum request was denied. Well the latest is that the hospital sent him back to jail, where the police are waiting for him. Right now it's unclear where he is exactly. Has he slipped away again?! There are other more complete versions of this story out there, and I encourage you to read them, but also read McAfee's blog - his version of events. All I've shared here is the rest of that pin on the iceberg. I guess I've shared this as a way to justify all the time I'm spending checking twitter and blog updates, reading news stories, and watching videos of this whole debacle. I really want to care a little less. I really want to spend more time on my dissertation. I just can't turn away from the drama. Oh wow! What a story! I can't wait until I don't do anything tomorrow except read all about this!! And strangely the last thing I keep thinking is, "Why'd he gave guns in a plant lab? Were there plants?" I keep thinking about that more than whether or not he committed the crime or not. Now we will see if money can buy you freedom! McAfee: "I believe that the press is beginning to believe itself. By that I mean that one publication writes a story with a given point of view. The next reads the story and uses that story to bolster its own, possibly similar point of view. The end result is a sort of collective dream from which the press can not easily wake up." McAfee is an interesting cat. On one hand he's a rebel adventurer that bucks the system and doesn't care what people think. On the other, he comes off as a rich white that thinks he deserves the fortune that he's had in life. I doubt he killed the neighbor though.